3/29/19 - Spring start up for irrigation is scheduled to start the week of April 8, 2019. Please leave your back gate unlocked to allow for access. NOTE: If your water shut-off values are located inside the home, in the garage, or in the crawlspace, please call LiquiGreen (970-256-1928) to schedule an appointment. Homeowners with indoor valves who have not contacted LiquiGreen to set up a time by April 30, 2019 will be charged a $50 fee for LiquiGreen to make a service call. REMINDER: Weekly mowing will be done on Friday morning starting April 5th. Please do not water your lawn after midnight on Thursdays or your lawn may be too wet and may be damaged by the equipment. 2/22/19 - A Board Meeting was held on February 18, 2019. Meeting minutes are posted below. 8/28/18-- The 2018 Annual Meeting was held on August 16, 2018. Meeting Minutes are posted below. 1. TRASH CANS ARE ONLY ALLOWED TO BE OUT FROM 7AM-8PM ON PICKUP DAYS! You may be fined if they are out on the sidewalk or if they are visible from the street at other than those times. The reason for changing the times is to prevent wildlife [bears, coyotes, etc] from entering/roaming the neighborhood. 2. 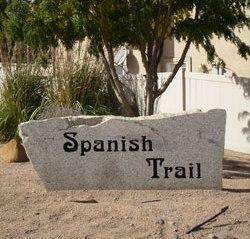 On street parking within the Spanish Trail neighborhood is not allowed. Parking in LANDSCAPED areas [including graveled areas] is NOT allowed. If you need addtional space, please contact Heritage Property Managment for information on getting a space in the RV lot [$15/month for each space]. Fines may be assessed for violations. 3. Please make sure that you/your tenant is watering the grass as well as any trees or shrubs on the property. 4. If you plan to make any changes to your property to include outdoor painting, fence changes, landscaping, etc you will be required to submit an ACCO Request (located below) to the Board of Directors and the ACCO Committee for approval. Welcome to the Heritage Family of Services! All should be directed to info@hpmgj.com. We are excited to work with you and assist you in the support of your HOA. Please let us know how we may serve your needs!